Microsoft Math full-featured graphing calculator with 3-D technology helps students visualize and graph math and science equations.It helps students get school work done quickly and easily. With a full-featured graphing calculator that�s designed to work just like a handheld calculator, Microsoft Math offers a wide range of additional tools to help students with complex mathematics. Get help with math and science homework. With Microsoft Math, students can learn to solve equations step-by-step, while gaining a better understanding of fundamental concepts in pre-algebra, algebra, trigonometry, physics, chemistry and calculus. Microsoft Math provides a set of mathematical tools that helps students get school work done quickly and easily. With a full-featured graphing calculator that�s designed to work just like a handheld calculator, Microsoft Math offers a wide range of additional tools to help students with complex mathematics. - Graphing Calculator Gives students extensive graphing and equation-solving capabilities, with large 2D and enhanced 3D color graphs to help them visualize problems and concepts. 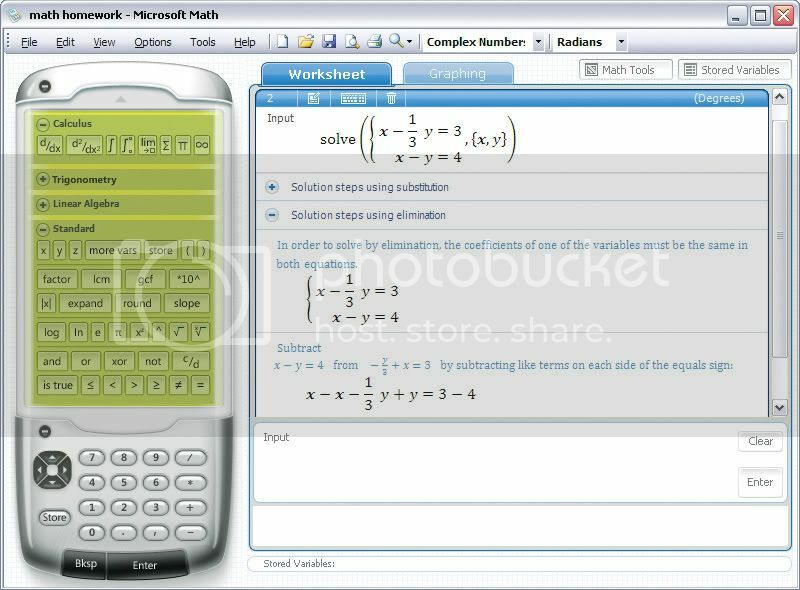 - Step-by-Step Equation Solver Provides students with step-by-step solutions to many math problems from basic math to calculus. - Formulas and Equations Library Puts more than 100 common equations and formulas in a single location. - Triangle Solver Helps students explore the relationships between the parts of triangles. - Unit Conversion Tool Makes it easy for students to convert different units of measurement. - New! Ink Handwriting Support Works with Tablet and Ultra-Mobile PCs, so students can write out problems by hand and have them recognized by Microsoft Math. Ju lutem une e shkarkova ket program por me thot se nuk e hap dot ket program. A ka mundesi te ma shpjegoni edhe ma shume ket ju lutem, sepse eshte program qe me duhet shume.